Records of student progress, Assessment and transcript. Because parents of eTAP students frequently take on a teacher's role, this guide includes using some features typically used by teachers. A lso this guide shows parents with more than one child how to see the test progress records of all their children in one location and how to provide seperate log in for each of their children using different email addresses. If you have not already created an account, register at http://www.etap.org/amember/signup. eTAP has a Free Trial, which gives you full access to the website for 15 days. Sign in. All lesson material, tests, records and resources require user authorization. The sign-in page is located at http://www.etap.org/login/, or the link may be found at the top right side of eTAP's main page. Select a grade level from the drop-down menu in the right column. For this guide we have selected grade 8. Choose which subject you want from the list towards the top of the page. You will see a Table of Contents for your selected subject. For this guide we have selected Science. Decide which lesson you want to view. You may select the unit title, which will take you to the Lesson Preview, or you may directly select a specific lesson in the unit. for this guide we have selected Speed and Velocity. Above is shown the student log in which is the default log in for the Free Trial. Students: Here is where you link your account to your students. Test Prep: The test prep menu. Each page accessed from this menu gives a table mapping eTAP lessons to topics covered by major standardized tests like the GED, ASVAB, SAT and more. Settings. This takes you to a page where you can update your subscription, and manage your password and user information. Important for Parents/teachers: On the 'Edit Profile' tab of this page, there is a setting for 'Teacher or Student'. If this is set to 'Teacher', you will be able to access teacher-related functions, such as adding individual students, viewing your students' scores and editing content to make custom lesson. 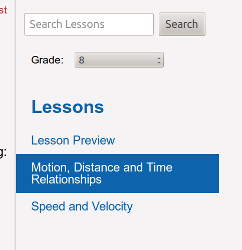 When you select a unit title, you will first see the Lesson Preview. This will summarizes the lessons, and lists what you will expect your students to know after completing the unit. On the right hand side of your screen, you will see a menu listing what sections this unit has. Use this menu to choose a section to study, or to move on to the next section. The top of each section will have a link to Pre and Post tests. Below the lesson title, you will see information about what state standards this lesson meets. Pick a unit to work on, choose a lesson and take the Pre Test. The Pre Test will help you understand what you need to learn from the lesson. If you get all the answers correct you can advance to the next lesson/topic. In this way you can use the pre Test as a placement test or to do a review for an AP test or another examination.